The Moptop: Thanks so much Kelly! I just wanted to show off the cutest gift that I've possibly ever received since my start of blogging. 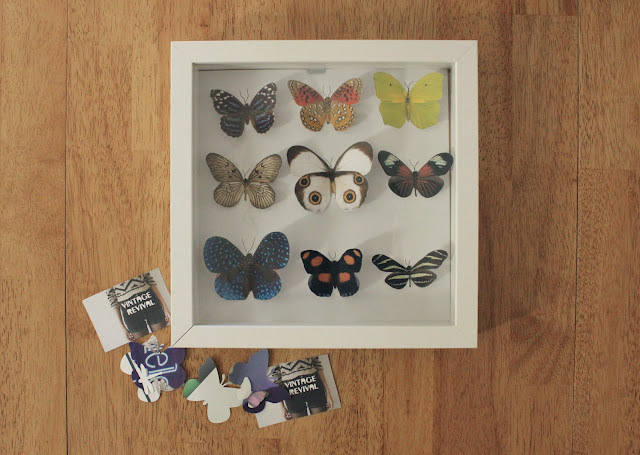 I am so in love with my new faux butterfly shadow box Kelly from Vintage Revival made for me! I've had a recent obsession with butterflies, so getting this really was a huge treat. Also, I am moving in a couple weeks & this will be such a cute decoration for my new room! <3 Thanks so much again Kelly. How cute! That's cool that they're not real, but it totally looks legit! That's amazing, such a lovely gift! oh this is really beautiful. this is awesome! definitely a rad gift.